What types of content can I order? We handle just about any type of writing your brand could need. We specialize in blog posts, social media posts, white papers / e-books, bylined articles, press releases, copywriting (emails, product descriptions, or marketing collateral), scripts, and speeches. We also offer editing and proofreading services. Have another writing format in mind? Simply request a quote for your custom content type. We’ll get back to you within 24 hours. How do I order content? After selecting your desired content type, you’ll be prompted to fill out a short content brief (customized to your chosen content type) that will guide us in writing to your specs. The content brief is a fast and simple way to communicate your needs, from length and target audience to preferred style and tone. Most fields are optional, but the more you fill in, the more we can learn about your content goals — leading to the best result. As soon as you submit your brief, we'll get started! From this point forward, you can track the project from your dashboard — and receive email updates at each project milestone. Can I order content on a one-time basis or on a regular, recurring basis? You decide how Prose can best serve your needs. Content can be ordered as a one-time project (à la carte) or as a recurring plan (on a consistent, ongoing basis). All content types can be ordered à la carte. The following content types can also be ordered on a recurring basis: blog posts, bylined articles, white papers, and social media posts. For instance, you might request two blog posts delivered every Friday, or a white paper delivered on the first Monday of every month. For recurring orders, you’ll be asked to choose your desired frequency (e.g., two posts per week). Select your preference from the drop-down. Where can I find a free instant quote? 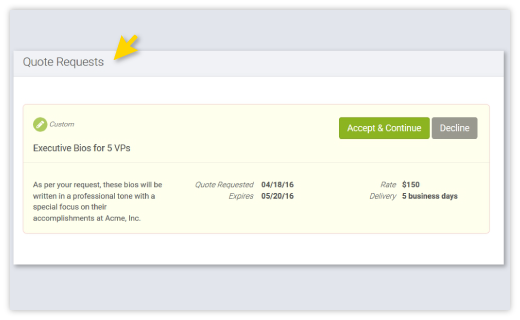 As you fill out the content brief, the order total will be displayed at the top right. To see a breakdown of the cost, or to view the exact “Deliver By” date (in the case of one-time orders), click the drop-down. The price for your order is calculated automatically according to our published rates based on the options you select (content type, length, writer tier, quantity, frequency, turnaround time, etc.). For one-time orders, the price displayed reflects the total cost of your order, to be charged as soon as you receive and approve the completed content. For recurring orders (e.g., two blog posts per week), the displayed price reflects the total monthly cost. You will be charged on a monthly basis from the month you first place the order until you cancel the plan. What is the turnaround time for one-time orders? Standard delivery is included in our fees. Rush orders incur an extra 20% charge. Specific turnaround times will depend on your selected content type and length. When you place an order, your exact delivery date is immediately calculated and displayed. Does lead time start the moment I place the order? Turnaround times are based on business days. (Prose is located in NYC, so the business day is 9 am to 6 pm ET.) The turnaround period for a given project begins on the first business day after an order is placed. For example, if you order a blog post with a 5-business-day turnaround on Monday, June 1, at 3:15 pm ET, the turnaround period will begin on Tuesday, June 2 at 9 am ET and end on Monday, June 8 at 6 pm ET. You will receive your content at or before 6 pm ET on Monday, June 8. What if I’m requesting topic pitches? If you’re requesting topic pitches, the turnaround period does not begin until you have approved a topic. The turnaround period will begin at 9 am ET on the first business day after you approve a topic. How can I track the delivery date? Once you place an order, the expected delivery date for the content will appear on your dashboard. What is a “business day”? What is the timeline for topic pitches? How long do I have to review my content? Once I request revisions, how long will it take to receive them? The Prose business day is 9 am to 6 pm ET. The clock starts ticking at 9 am ET on the first business day after you order content, request topic pitches, or request revisions; and you receive your content by 6 pm ET on the delivery date. The content type I need isn't listed on your site. Can you write it anyway? The answer is, most likely, yes. Our writers specialize in a wide range of content types, including many not listed on our Solutions page — and we keep meticulous records of these capabilities. From cover letters to executive bios to taglines and more, just ask. This option appears prominently at the bottom of the menu. Selecting “Have another type in mind?” will bring up a single-page quote-request form. Here you can go into as much or as little detail as you’d like. Submit the form, and our editors will get to work preparing a quick quote. The quote will contain the relevant rate, the required turnaround time (e.g., 5 business days), and any special comments or provisions from our editors. To move ahead with the quote, click Accept & Continue. To pass, click Decline. Clicking Accept & Continue will bring you to the official content brief partially filled out with your previous answers. This is your opportunity to further clarify your needs and/or provide more detailed instructions. (To avoid delays, please ensure that your additional comments do not change the scope of work from the original quote request.) Your order will not be officially placed until you finish filling out the content brief. Once you’ve filled out the brief, click Submit — and we’ll get to work! 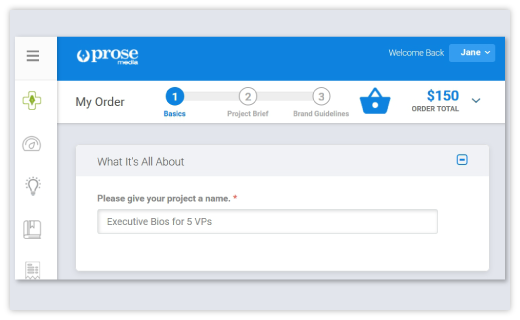 Your project will now appear in the “Content in Progress” section of your dashboard. From this point on, your custom content will go through the same process as all the other content types. I need a large volume of content. Can you help? Absolutely. We’re pros at creating high-quality content at scale. Whether you need 50 pieces a month or 500, we’re happy to help. In many cases, we also offer discounts for recurring content plans. These discounts will be automatically shown on the order form. Of course, if you have questions about a large volume content order, feel free to reach out to us at any time. When will content for recurring orders be delivered? If you need content on a recurring basis (e.g., weekly blog posts), you can specify how frequently you want the content to arrive. For instance, if you’d like your content to arrive on a specific day (e.g., a blog post every Wednesday and social media posts every Friday), let us know and we’ll schedule accordingly. Content due will be delivered by end of day (6pm ET) on the day requested, unless otherwise specified. Your dashboard doubles as your editorial calendar. To track the delivery dates for the individual items in your recurring plan, refer to that plan in the “Content in Progress” section of your dashboard. Here you’ll see each content piece listed, along with its scheduled delivery date. Is there a minimum order or time commitment? The content brief is a short online questionnaire, customized to your desired content type (e.g., blog posts), that guides Prose in writing to your specs. Use the brief to give us details about your content requirements, from style and tone to length and format. You also have the option to attach additional source materials, such as a style guide or branding guidelines. The brief is easy to complete and designed to be flexible. Most fields are optional, and many of your brand preferences will be automatically carried over and applied to future briefs. As you fill out the brief, tips and examples are available next to each field. Just hover over a field, and “Help text” will appear in the right-hand sidebar. The goal of the content brief is simple: It gives you the opportunity to define your expectations so Prose can meet and exceed them. Can you walk me through the content brief? The content brief has three main sections that are quick and easy to fill out: the order form, specific project details, and general brand guidelines. The second section is the place to explain the specifics of this project and how you want the content written. Here you can let us know the topic, the key points you want to make, any keywords you want us to incorporate, any research you want us to perform, and the tone, style, and goals of your project. Providing a clear, thorough, and detailed brief will give our writers and editors the best possible chance of hitting the mark with the first draft. Do different content types have different briefs? Yes. Each of our ten primary content types has a unique content brief. While these briefs share many of the same features, many questions are specific to the particular content format. For instance, a brief for Twitter updates will ask about hashtags, while the brief for a corporate speech will ask about length in minutes and who will be sitting in the audience. Prose recognizes that each type of writing has unique requirements and best practices. This level of nuance differentiates us from cookie-cutter writing services that work from a single generic brief. Our separate-brief approach guarantees that every piece of content will be crafted to your exclusive specifications. How detailed should I be in the brief? How much guidance does Prose need? We're flexible by design: We can work with as much or as little information as you wish to provide. Some clients provide explicit instructions (e.g., full outlines and ample supporting materials). Others prefer to remain largely hands-off by offering a few bullet points. The brief is designed to cater to your style, whatever it may be. If you only want to give a couple of instructions, you can write a “freestyle” project description. If you have specific expectations and want to give thorough instructions, you can answer each question in detail. Almost without exception, the more detail you provide, the better your content will be. By “better,” we mean content that meets your particular goals. While our system is designed for time-saving efficiency, taking the time to be comprehensive is an investment that pays off. Find the balance that works for you — as always, we’re here to help! Granted, we know that you may not have the time to provide clear guidance. We also understand that it can be easier to react to a draft than to think things through beforehand. But here’s what happens behind the curtain: Your writer jumps into action based on a brief that details your vision and preferences. He or she spends hours creating polished, on-message prose — only to discover that you prefer a different direction. Project planning must occur before or during the briefing process, not after the piece is written. The content brief is the time and place to determine how your piece should be written. Just as an architect and a client must agree on a blueprint before the house is built, a writer needs a detailed plan in order to construct quality custom content. How much guidance needs to come from me, and what can the writer come up with on his/her own? We know you’re busy and we do everything possible to minimize the time and effort you need to spend briefing us. We’re happy to pitch topics, and we strive to be resourceful and self-sufficient during the writing process. Content marketing (e.g., blog posts, articles, white papers, social media) is content that requires knowledge of an industry or topic. The content is not specifically about your company, so very little briefing time is needed. Prose writer(s) are selected on the basis of relevant industry expertise. They know how to fill in any gaps with research. Copywriting (e.g., website copy, marketing collateral) typically requires knowledge about your company and offerings. Dedicated marketing content may require more briefing, but you can take advantage of what you already have. Help us learn about your brand by sharing resources like your website link, a press kit, or existing collateral. Can I supply additional source materials with my brief? Yes! The more materials you provide, the better. As writers, we would rather have too much information at our disposal than not enough. The content brief makes it easy to share assets and resources that you would like us to review, such as a URL, a Word file, or a PDF. Listed below are some examples of assets you might want to share in the different sections of the brief. Your own content brief. While our brief is designed to cover the basics, you might prefer to replace or supplement it with a briefing format of your own. Outlines, notes, or bullet points. Don't worry if these are roughed out or even full of misspellings. Give us the “raw material,” and we’ll work our way through it. Completed content (to rewrite or repurpose). You may want Prose to rewrite or repurpose existing content (e.g., turn a white paper into a blog post series, or create external web copy from an internal PowerPoint presentation). Examples of content you like and want to emulate, such as materials relevant to your industry (e.g., published by your competitors) or content from other industries (provided as general reference). Branding guidelines. Your brand has a voice — a specific style or tone you use in every publication, from tweets to white papers. If you have a formal set of guidelines, feel free to share it. Style guide. Can’t stand the Oxford comma — or love it? Hate it when people use “that” instead of “who”? Does the word “leverage” make your heart sing — or your skin crawl? Let us know your stylistic preferences, and we'll adhere to them in everything we produce for you. External collateral (i.e., marketing materials). Help us learn more about your company by sharing marketing materials such as press kits, brochures, one-pagers, or sell sheets. Internal collateral (i.e., strategy materials). You may wish to share a business plan or a formal marketing or communications strategy. From internal memos to PowerPoint docs, these materials help us create content in line with key objectives. I'm better at speaking than writing. Can I “dictate” instructions? Yes. Each brief offers an option to record a dictation of up to two minutes. You are welcome to dictate all of your instructions, or use this feature to supplement your written answers. Needless to say, anything you record will remain entirely confidential. Click Start and enable your microphone. Then click Record, start speaking, and click Stop to finish the recording. The recording is now saved. 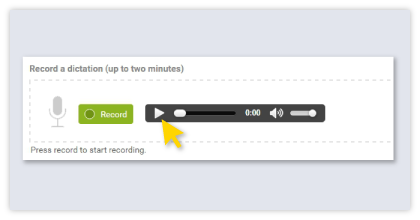 You may click the "Play" button if you wish to listen to your recording, or click Record again to record over it. Do I need to fill out the entire content brief each time? No. Prose will automatically carry over many of your previous answers — namely, those related to your organization and your overall goals. The content brief has three sections. The first two pertain to the project at hand and must be completed each time. The third section on "Brand Guidelines" consists of general questions that apply to all projects. You only need to fill these out once. Your content should be as unique as your brand. To craft truly custom content, we need the “big picture.” What is the style and voice of your brand? What sets your company apart? How does branded content fit into your larger strategic objectives? “Brand Guidelines” is the third section of the content brief, as well as a section you may fill out anytime. It’s the place to provide information and/or assets that will help us better understand your brand. Tell us about your company (e.g., web URL, offerings, competitors, unique selling points) and your overall content goals (e.g., style, tone, audience). To save time, you can upload file attachments such as branding guidelines or a style guide. Completing “Brand Guidelines” is optional, but well worth the effort. Even if you prefer to skip some of the free-form questions, we make it easy to upload files (i.e., brand assets such as style guides or marketing collateral) that steer us in the right direction. Most importantly, you only fill out this section once. Your answers will appear pre-filled on all future content orders. How and when should I fill out “Brand Guidelines”? You can fill out and update the Brand Guidelines at any time — either when you have time, or when you place an order. ​In the left-hand sidebar, click on Brand Guidelines to access this section. Then click the "Edit" link. Many clients complete this section shortly after joining Prose, before placing their first order, but you may fill it out anytime. Whenever you fill out a brief for new content, “Brand Guidelines” will be the third and final page. Any answers you’ve given previously will be pre-filled, although you are free to edit or add. Otherwise, complete this section for the first time. Do I need to sign a contract or have Prose and/or its writers sign an NDA? A separate non-disclosure agreement with Prose is not necessary because our terms include a strict confidentiality clause. All of your information and materials are kept entirely confidential at all times. Similarly, an NDA for writers is not required, because our writers are bound by the terms of a strict contractor agreement that includes a policy on client confidentiality. For the time it takes to fill out a content brief, wouldn't it be easier to write the content myself? Jotting down basic ideas and instructions takes far less time than planning, researching, composing, editing, and proofing a polished piece of professional prose. Delegating work always inevitably requires some upfront investment, but the time savings are clear. In addition, quality writing is seldom a one-time need. Most of our clients found us because they were looking for a sustainable, long-term content solution — and they’ve stayed. Unlike many services, Prose has institutional memory. We learn from your content briefs and carry that knowledge into future projects. For example, with Prose, you only have to fill in the general brand guidelines once, and we take it from there. The initial learning curve only happens once, and unlike a freelance or in-house writer, we’re always available — day after day, year after year. Can I hire Prose to repurpose my existing content? Yes. Many clients rely on us to rewrite or repurpose existing materials into other content types, whether or not Prose created the original. For example, you may have a white paper that you want to use as the basis for a series of blog posts, social media updates, or marketing emails. To repurpose or rework existing content, place an order for the new content type you want us to create. In the main “Describe Your Project” field, indicate that you would like to repurpose a document. Then, in the “Upload a File” section, attach the relevant document(s). Would Prose help us decide on the content types that might be best for our team? Yes, our experienced content marketing professionals are happy to make recommendations. Please contact us to discuss. Can I cancel a project after I’ve ordered it? Should you need to cancel an order, please contact us immediately. Any Prose project can be canceled within the first 15 minutes without penalty. You will not be charged. If Prose has already processed the order, you may receive only a partial (0% to 25%) refund. Prose engages its editors and writers very quickly to ensure quality results and rapid turnaround, so any cancellation refund will depend on your order’s stage of completion. Refunds are never issued once you have received a draft. Deeply committed to your satisfaction, we offer two rounds of complimentary revision. If I place an order, can it be declined by Prose? Yes. While extremely rare, an order may be declined. These rare occasions include content deemed inappropriate or legally questionable per our Terms (e.g., discriminatory or defamatory material); highly technical content requiring significant and very specific industry expertise (e.g., an M.D.) for which the writer tier you’ve selected (e.g., “Standard”) is insufficient; or writing suspected to be intended for academic coursework. We will notify you via email if we are unable to complete an assignment. On your dashboard, the project status will be changed to “Canceled,” and you will not be charged. Note: If you suspect that your content request might be inappropriate per the above, please contact us first or use the "Request a Quote" option prior to your order.